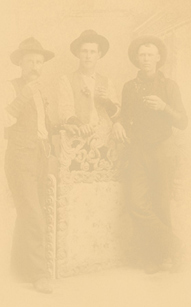 Your favorite Cowpoke, Cowgirl, or "LITTLE WRANGLER" never looked so good. 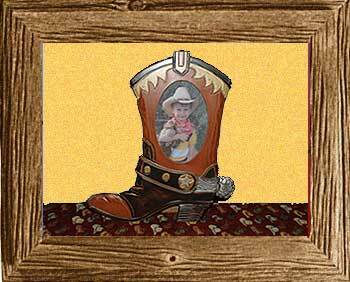 This boot shaped frame shows off any photo with maximum appeal! A fun accent for home, office... or even the barn. Holds a 4" x 6" photo. Easel back. Weight 1 lb. MDF wood and glass cover. 10 1/8" x 3/4" x 11 1/2" high. Ever wonder what happens to that left over skin from hatbands? Presto! Belt Buckles and....Key Chains.It might be added here that all skins are subject to availablity at time of order.Longhorn Hatters is not responsible for any State Law which bans certain skins as an endangered species. Oval shaped (3"x21/2") belt buckle with brown stitching around whole buckle. Nice! All chains are sturdily made, and guaranteed to hold more than four keys. Hand crafted and painted by hand, this sculpture brings back a Pony Express rider from the Old West. Great for office display. 10 1/2"x 9 1/2" x 4 3/4"
Birds can stop in for a rest, or use "The Wagon Wheel Restaurant" as a display for office, den, or game room. 9 " x 7" x 9 7/8" high. Custom lettering available upon request. (add $20.00).